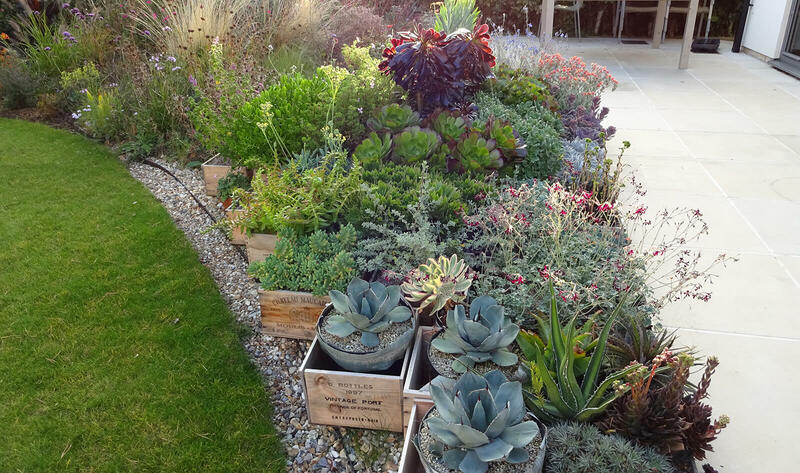 Succulents are very easy to look after as long as you follow a few simple steps. To generalise they thrive on neglect, most people kill them through overwatering them. “Don’t Overwater them!” All this is explained in more detail in the guide below. As long as there are drainage holes, most types of containers can be used for growing succulents. If a container such as a pot or jar does not have these they must be drilled. Plastic pots are easy and functional but terracotta pots are more aesthetical and keep a natural cool root run. They also hold moisture particularly if sunk into a sand bed. It is a myth to put crocks over the drainage hole and in plastic pots completely unnecessary as they have many small holes too small for compost to drop out. Maybe a mesh or paper tissue can be used over the large holes in a terracotta pot, the main purpose of which is to stop the compost leaking out of the hole when dry. Then once the roots of the plant are established they will hold the soil together. 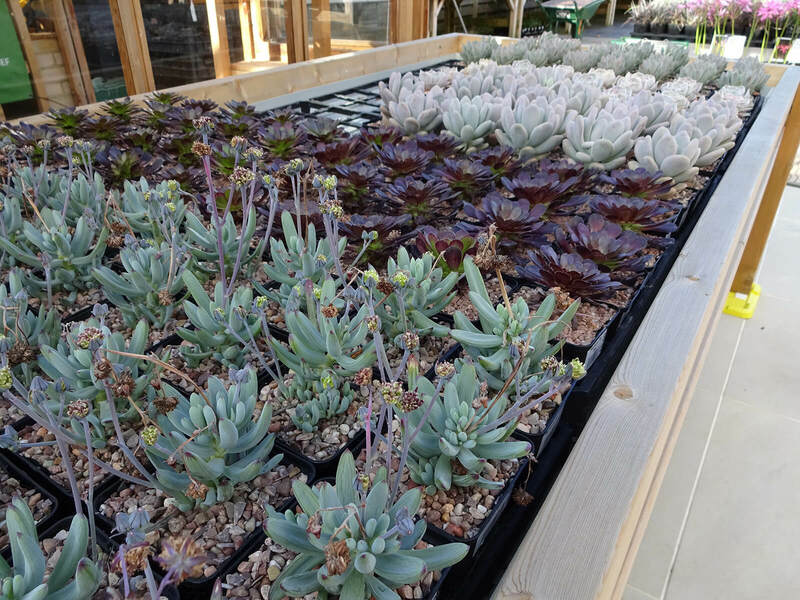 If you speak to anyone growing succulents you will find everyone has a different substrate mix that they swear by but however this may be confusing. One thing that any mix must have is to be free draining, porous with open and large particles. I recommend a 50/50 – 40/60 mix of multi-purpose compost/ perlite, pumice, potting grit, pine bark. The ratio of which to one another Is all down to personal preference and is often adjusted dependant on the particular plant group for example Aeonium may need a higher ratio of compost to large grain drainage particles as listed above, whereas the silver leaved Echeveria growing in the hotter sunnier locations in Mexico require a higher ratio of large particles for drainage and less compost. Always try to research where each species that your growing what conditions it has in it’s habitat in the wild to determine soil and light requirements etc. Succulents need little water and thrive even if your away for weeks at a time. As long as you follow a few basic rules you can achieve great success! Watering can vary dependant on where the succulents are grown, as if indoors with central heating they may need watering more often. If grown outdoors however, sometimes very little watering is required. Some plant groups within the succulent families need more or less water also. 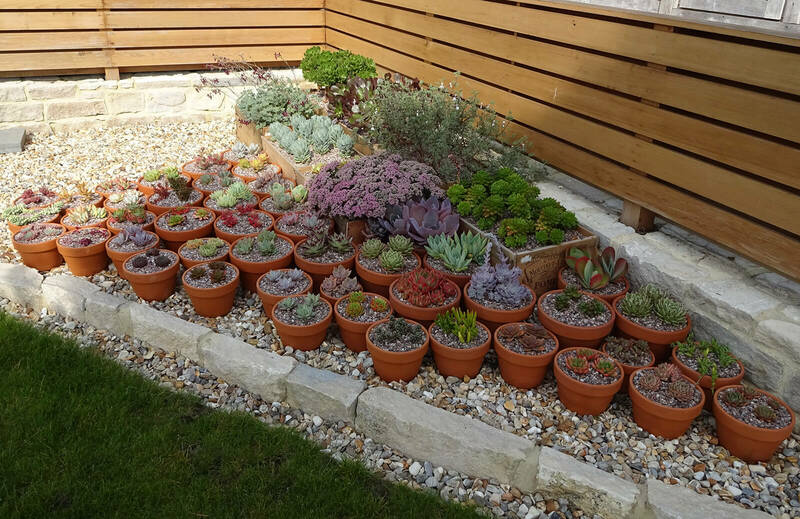 The rainfall in the UK is often sufficient when succulents are put outside. “During the Summer Months” (May/ June – till Sept/Oct) as we usually have rain every 2-3 weeks occasional longer dry spells. With no rain for over a month may require some watering. 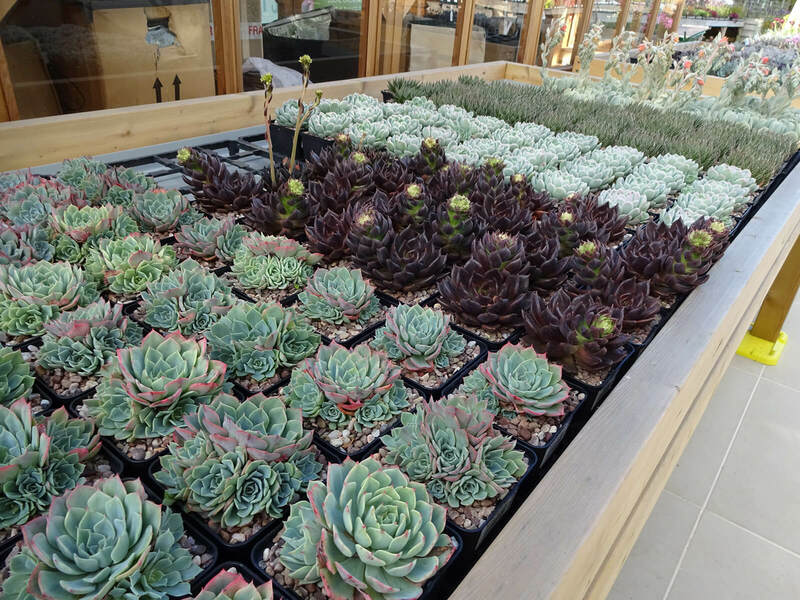 Succulents store a huge amount of water in their leaves and stems so therefore the soil does not need to be always wet. 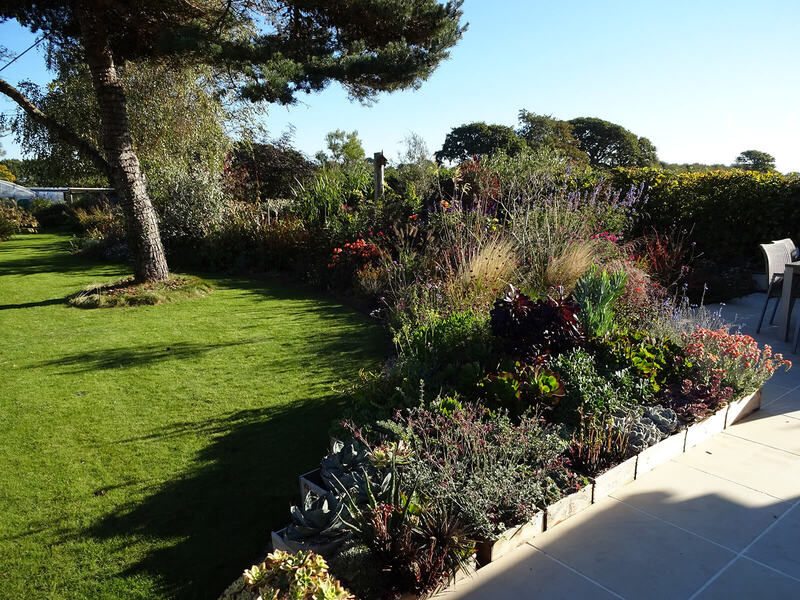 It is best to allow the soil to dry out completely in-between watering’s. It is best to allow the soil to dry out completely before watering. Then give them a really good soak, I prefer to dunk in a tray of water 1 inch deep for only an hour, no longer or until you see it’s moist at the surface. This will allow the plant to develop a much tougher root system. This will lead to a more compact and healthier plant and will allow the colour In the leaves to develop, as overwatering leads to soft fleshy green growth. If grown tougher it allows the natural colour to develop especially if they also get enough light and sun. This replicates the conditions in nature plus if you don’t over pot them once they are competing for nutrients the colours in the foliage develops better replicating the rocky habitats they grow in the wild. 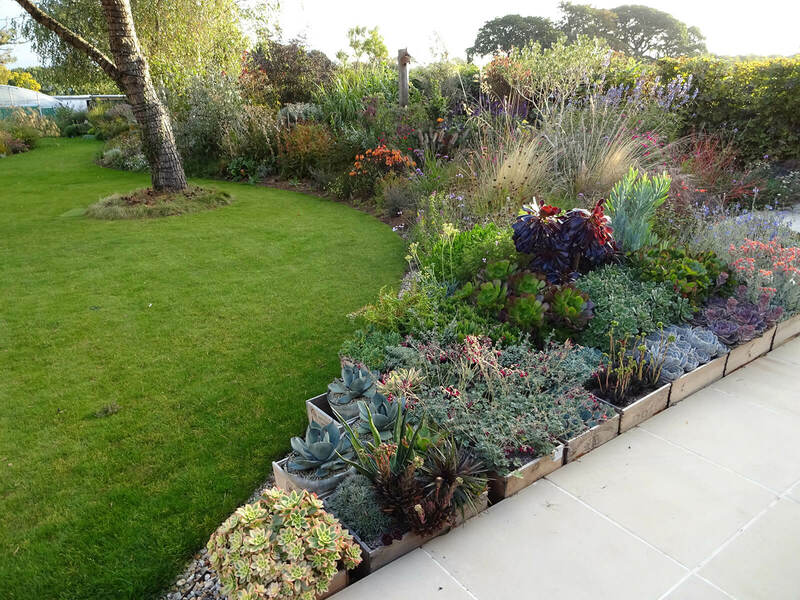 Most succulents when grown outdoors in the UK during the summer months (May/June- Sept/Oct) are happy to be grown in a open and sunny position. Some varieties of the bigger leafier plants i.e. Aeonium, Crassula and the thinner larger leaved Echeveria prefer more shade. Generally if it has a very small dense tight rosette it usually requires more sun! Succulents love wind as they are adapted to open windy deserts. When growing succulents indoors especially in the home it is very important that they get enough light. If they get too little light this can lead to stretched growth looking for the light and paler washed out colours in the leaves, if you plant is growing tall and straggly and the leaves are turning paler green then it is not getting enough light. Some succulents like Haworthia and Crassula, some Aeonium paler leaved varieties can tolerate lower light levels. 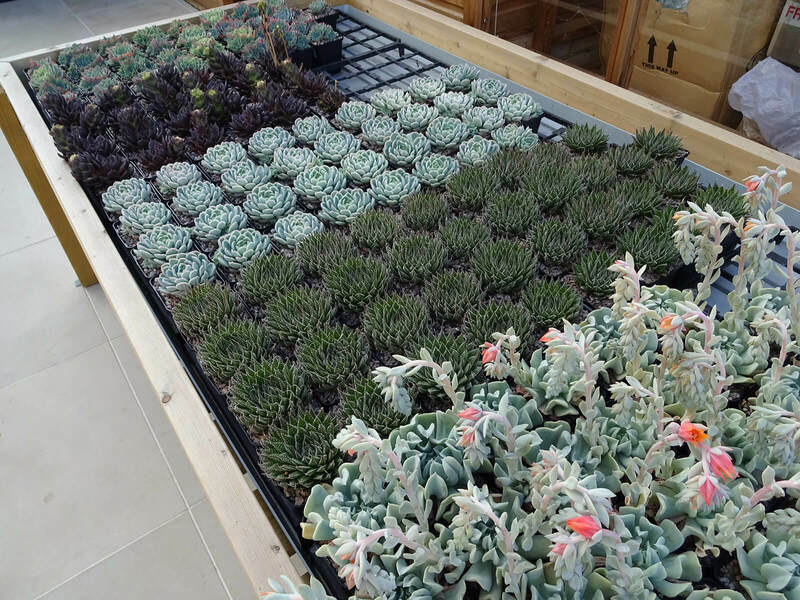 Ventilation is very important as in native habitats succulents grow in open windy deserts, and this leads to more compact and colourful plants. It is best to situate especially in the winter months the varieties that require the most light on a sunny south facing window or aspect as in a greenhouse or conservatory. However in summer in most cases it is best (if you have the space!) to move plants outdoors. If you can’t, if in the hot mid- summer sun it can be too hot on a South and West facing window and plants can get scorched and sunburnt here it is best to move to a North or East Facing window or if this Is not possible some shading and ventilation may be required on a South or West facing aspect.